The Bookman's Promise by John Dunning, a Mysterious Review. Review: The Bookman's Promise, by John Dunning, is the 3rd mystery in the Cliff Janeway series with the ex-cop and current used bookstore owner searching for a lost collection of books by famed explorer Richard Burton. Dunning has once again produced an outstanding, literate, and creative work of crime fiction in a series that began with Booked To Die, winner of the prestigious Nero Wolfe Award. Dunning has taken a fact-based historical mystery of the trip Richard Burton made to the US in the mid-1860s and seamlessly blended it within a fictional search for a journal by Burton that may by the key to its solution. Upon concluding the book, many readers will likely spend time researching the life of Richard Burton; as a helpful start, Dunning provides references to three biographies that no doubt played a not insignificant role in crafting this story. In addition to the mystery of the Burton collection, there is a murder to be solved. Watching Janeway piece all the evidence together to what is, in retrospect, an obvious solution, is one of the joys of reading a mystery in this series. Dunning is a master at hiding the clues in plain sight just waiting for someone, the reader or Janeway, to connect the dots. 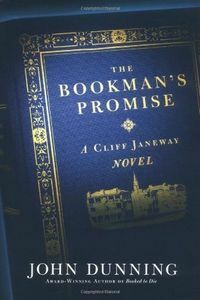 The Bookman's Promise is one of the best mysteries of the year and should be on every collector's bookshelf.